added this week is Ellis Country Living Mag. Here, Jason's Imagination & The Rain King have been featured along side with a few really great authors. It is a wonderful privilege to be a part of ECL Mag's March issue, and I can't thank them enough for such a great review. I have had one heck of an adventure this year, and it's just getting started! I have made 4 TV appearances, written an article for a parenting magazine, I made one of THE most inspirational road trips you could only imagine in our dreams. I now can add The San Antonio Book Festival to this list, April 7th 2018! It is OFFICIAL I will be an exhibitor in the children's area where I will have books available for sale, and will also sign them. To think that 4 years ago Jason's Imagination was just an idea, and a few words on a piece of paper. I can even remember being 500' in the air on a cell tower, looking out, seeing some of the best sunrises and sunsets making the decision to take a chance on a dream and here I am, book and all. Folks, I know life can drag you down, make it feel impossible to dream, to feel a sense of purpose, leaving you feeling like nothing more than another cog in the wheel, but trust yourself, trust your dreams, trust your passions... just trust yourself. If I can do it, anyone can. I suppose from the beginning, huh? It all started in San Antonio, TX where I currently reside. I had been invited to Portland, Oregon for my 3rd TV segment for Jason's Imagination and was considering how and which way to travel. Do I drive, or do I fly? With my explorer and adventurous side lighting up like a wild fire, I couldn't help but think a road trip was overdue. I was packed up, truck loaded, gassed up and I was now on the road heading Northwest to Portland. My first stop: New Mexico. Now I had lived in NM for about 2 years back in 2012 and knew most of the state from working on cell phone towers, so for me there wasn't much to explore that I hadn't seen before, but I had forgotten NM had some really nice sunsets. Now mind you I had a day and 7 hours to get to Portland for the segment on the 31st and thought I had planned everything just right, but just as I was getting into ABQ I was now 7 hours in and realizing I might have under planned the trip just a bit, so I stopped, took in one more sun set then made a good solid night of driving straight though to Salt Lake City, Utah. As I woke that morning from a 20 hour drive I was running on adrenaline, excitement and an hour or so of sleep, but I needed to hightail it to Oregon as fast I could. 11.5 hours left of the first leg and I was running on empty, thinking to myself "I should have flown"... but then... Oregon. Oregon was absolutely worth the drive. Worth the 30+ hours. Worth the exhaustion. Just plain worth it. After a few more hours of naturally manicured rolling hills of Eastern Oregon I had finally made it to Portland. Now settled into the hotel I was ready for some sleep. The following day was the day of the interview with Afternoon Live w/ host Tra'Renee, which was amazing! Tra' was very welcoming, as was the crew. I chatted with some of the other guest, then made my way to the studio. I was mic'd up and ready to go. Being my 3rd segment I felt I really handled this one well, but I can't take all the credit, I was given some much needed encouragement from a new friend I had made from my time on the set of We Are Austin; Trevor Scott. Trevor & Taylor are the hosts of a local show in Austin, which was my very first TV appearance. 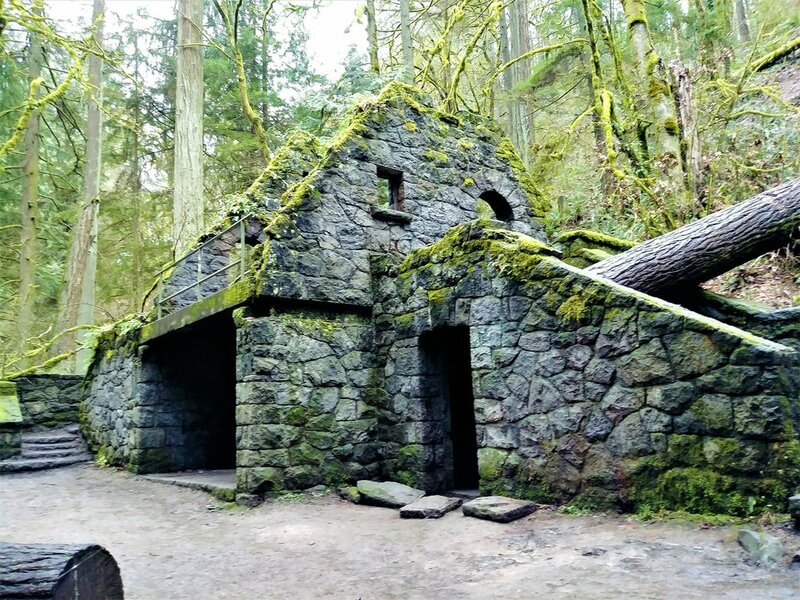 Before the segment at 2:15pm I decided to go hiking that morning in Forest Park to see Witches Castle... did not disappoint. I hiked down the path that had a small creek running beside it where I met a fellow photographer named Dave photographing the creek. He was an older gentleman, retired and very kind. He too was hiking to see Witches Castle, so together we walked towards our destination catching up like we were old friends. That evening I wanted to find a local favorite restaurant, and in my search I found the Tin Shed. I was greeted by a lovely waitress who sat me at my table, offered me a menu and took my drink order. I simply asked what was the local fav in eats and drinks here as I was new to Portland. She recommended what was called the Lazarus quesadilla and a local IPA. Now let me tell you about this quesadilla, this thing was AMAZING. Filled with black beans, jalapenos, sweet potatoes, sharp cheddar and jam... yes I said that right, JAM! It was a raspberry or black berry jam and made the whole dish! During my dinning experience she welcomed me to Portland, asked why I was visiting, I told her about my book and the segment with Afternoon Live. She asked about the food and of course I had nothing but fantastic things to say. My evening was nice, quiet and in some ways mindful with a sense of peace. Portland was stealing my heart like a thief in the night. I wasn't quite ready to head home just yet so I managed some time to stay one more night, and the next day I made my way to one of the local attractions; Pittock Mansion. This home was massive, beautiful and once owned by the Pittock Family. 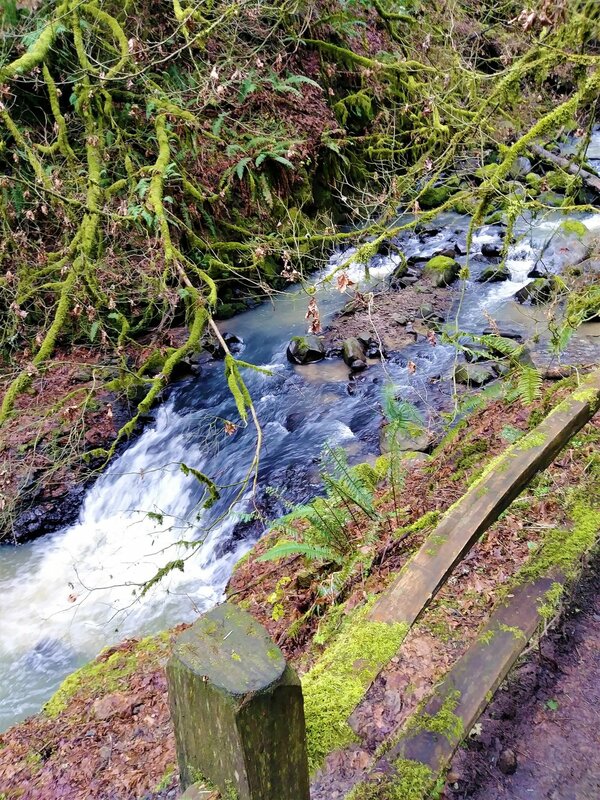 Built in 1909 by London-born Oregonian publisher Henry Pittock, and his wife, Geogiana. The Pittocks were one of Portland's 1st AND most influential families, arriving sometime in the 1850's by wagon train! This 46 room estate was built by Tenino Sandstone on 46 acres in the West Hills offering panoramic views of downtown Portland. Now owned by the city's Bureau of Parks and Recreation completion wasn't until 1914 and averaging 16,000 SQFT. Designed by architect Edward T. Foulkes, the mansion featured such luxuries as central vacuum system, intercoms, indirect lighting, and a walk-in refrigerator. My next stop; Cannon Beach. I figured I had been coast to coast ( San Diego, CA for the West coast and Myrtle Beach, SC for the east coast), it was time to add the PNW coast to that list so I packed up and drove an hour or so to Cannon Beach. Now being the end of January the water was definitely on the "too cold to swim" scale but that didn't stop me from at least walking to the coast's edge. Its waters were calm and very scenic, folks were walking with their kids, dogs or for their afternoon run. I took my photos and then some lunch at a little place called the Driftwood. I ordered, again, another local favorite and drink, this time it was a Salmon salad with something called a Spanish Coffee. The Salmon was perfect, and the drink... well... different. Basically an Irish Coffee... was good, just different. From there I had to have desert, and devoured a brownie with vanilla ice cream. While eating my desert a friend of mine, Shane, had recommended that I should continue my adventure South into Northern California to see the Redwoods, which at that point made total sense. In PNW fashion the rain began to build up and forced most of us either inside, or in my case, on the road. 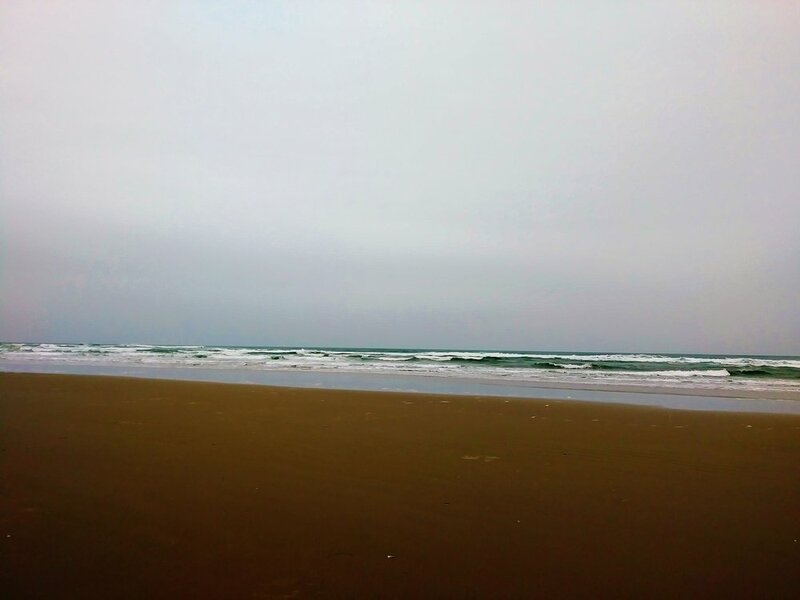 I now made my way South on the 101 following the Oregon coast down into Crescent City, California, a 400 mile trek, and by 10pm I was checked into a small, lovely hotel, the Anchor Beach Inn. The view from my room would live up to exactly what the Inn-keeper described. 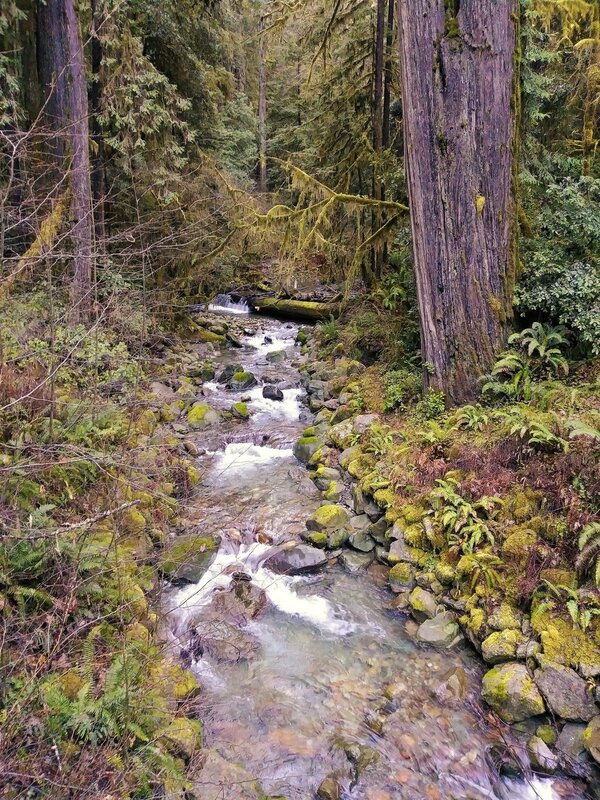 With a cup of coffee I packed up and headed out the door to experience the ancient forest; the Redwoods of California. 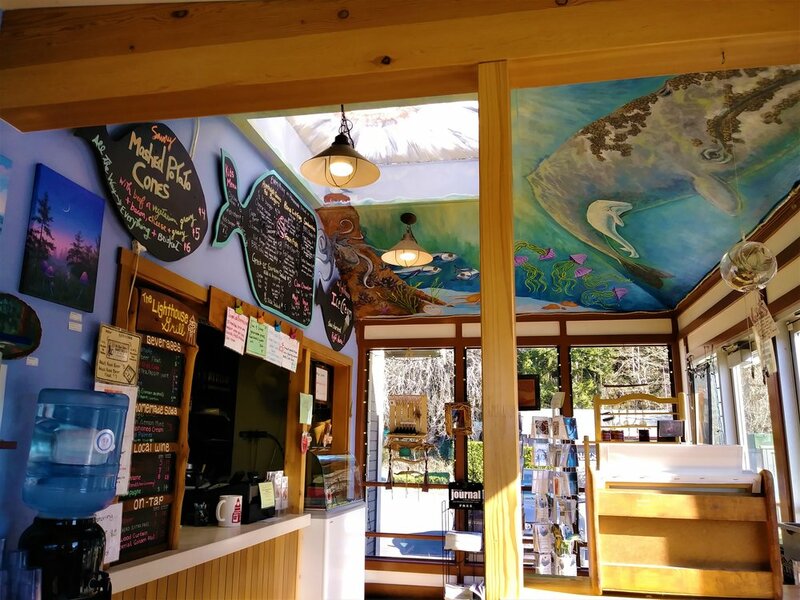 The girl at the front desk that morning gave me a few options, but said that I should check out one of her favorite spots called Sprout Grove. 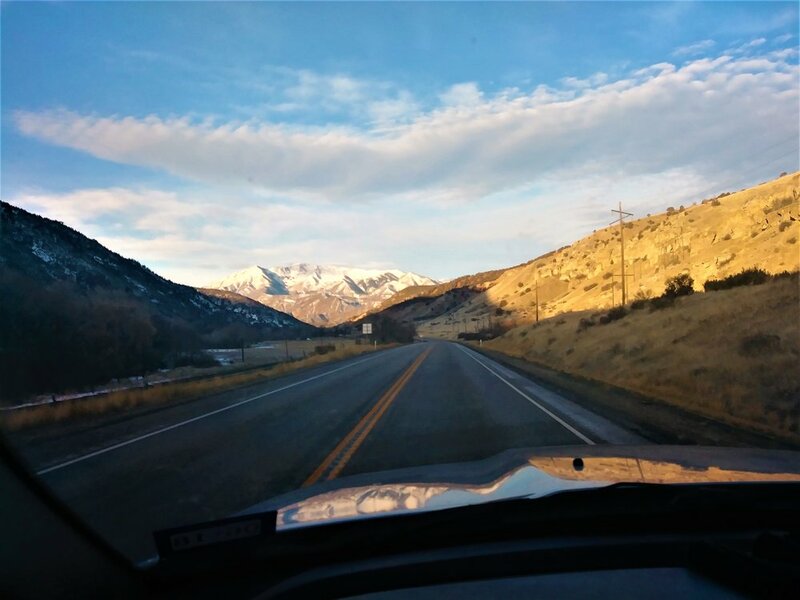 Sprout Grove is full of trees and winding roads made for a road trip and absolutely did not disappoint, but what made this trip so epic was by the time I reach Sprout Grove I had noticed moving trucks, cars, gear, tents... I wasn't sure what was going on so I decided to continue up the road where I was greeted by an officer who kindly told me I could turn around at this spot - pointing in a direction I really could't tell where. Well that ended up dead-ending into a large tent full of people. One asked what I was trying to do, of course I said "back out". With the help of this man and a few others they guided me back into a spot where I waited for a large van to come in. They directed me out and as I was leaving asked what was going on. Well to my surprise they were FILMING A MOVIE!!! Luckily for me they were in production set up and had not started filming anything just yet, but embarrassing enough as it was. I don't know what movie was being filmed, but every one who had helped me out were kind about the whole thing. So to those, Thank You! The redwood trees were massive, majestic and mesmerizing. The green from the moss was something otherworldly, standing next to them made you feel small and insignificant. The stories they could tell of the tens of thousand, if not millions of years they have seen. One could almost feel connected to everything out there. I know I did. Lunch time was now creeping in and I needed to stop. There I found myself in a small town called Trinidad, California. Trinidad would be one of the most beautiful stops on this adventure. The sun was out, the weather was perfect, the people friendly and the beaches just awe-inspiring. Just before Trinidad I made a quick stop on the 101 to photograph a part of the coast that nearly took my breath away. Finally in Trinidad I found another local favorite called the Lighthouse. This place was small with a very friendly staff. I made conversation with the girl who took my order, and after hearing some of the local favs I chose a burger made with blue cheese and a jalapeno jam... again with the JAM, but folks you have no idea how AMAZING this burger was, and to add to the awesomeness of this food was a homemade cream soda. During our conversation we talked about why I was visiting, where I had been traveling and such and from there she told me about a place just off the 101 into Pepperwood which lead to The Avenue of the Giants where some of the larger Redwood tree are. San Francisco was the next stop, and just about where I began to feel the strain of the road. I found a motel, somehow parked my big 4X4 Dodge into the parking spot, ordered some sushi and just called it a night. Morning came and I just wasn't feeling the city, or maybe I just wasn't feeling the adventurous side of me as much as I had on the beginning of this journey. Plus parking was near to impossible for me with the truck and honestly it was just another big city to me. I mean I saw the houses like I use to see on the show Full House growing up, I saw the Golden Gate Bridge (at night), a few parks, but nothing that just stopped me enough to go explore. Maybe some other time San Fran. I was back on the road and had made plans to be in Mesa, Arizona that evening to see an old friend and her son whom I had known since 2009. I was in Bakersfield when another friend of mine in San Diego contacted me to come swing by and have dinner. Needing to get off the road and maybe some sleep I punched in SD on the GPS. L.A. was super busy. Traffic lived up to its reputation. Though I'm sure L.A. has its own charm I was just ready to eat and rest for the night. I met up with Joseph and had dinner at a nice restaurant, Saska's, for steak. I have to say SD you did well for a steak not cooked in Texas, lol! The evening was spent catching up on the road trip, the book and life. I met his roommate Carl after dinner. Nice guy. Read my palm. We all talked politics, social topics, general conversation. I had a nice time. By the time I made it to the hotel I was beat. Earlier that evening Joseph and I made plans to sight see a few things before I left SD. That morning we had breakfast and made our way to Cabrillo National Monument which gave a breath-taking view of the SD bay and the Pacific ocean. Balboa park was the final stop where we walked through the international houses and incidentally walked into the area where they keep the Spreckels Outdoor Organ. Luckily for us it was just at the right moment for the 2pm concert. Now the Spreckels Organ was donated to the city of San Diego in 1914 for the Panama-California Exposition. The unique organ contains more then 5,000 pipes ranging in length from the size of a pencil to 32 ft and is the largest outdoor organ in the world. The last exhibit was the science museum where I ended up showing my child-like spirit and had to press all the buttons I possibly could, and then finished with a film about aircraft carriers. San Diego was a good way to end the California leg of the trip. Mesa was another 5 hours east, and by this time I was ready to be home, but I couldn't leave without seeing one of my favorite kiddos, Ethan. I have known Ethan and his mom Elisha for nigh-on 8 years or so. They have been like family to me with Ethan being the closet thing I ever had to a son. We all had dinner, laughed, told stories and played with the dogs. I definitely missed seeing them. Back at the hotel I was exhausted. You never realize how overwhelming an unplanned, unintentional road trip can be. Morning could not come slow enough. I was not ready for the 982 miles back to San Antonio, Texas, but I lugged my sore, worn out body out of bed, packed up and made it back on the road. This trip was everything I needed and everything I didn't know I needed. You find new things about yourself. You get to measure yourself, wash away everything that has hurt you, let your spirit reset and discover new and exciting places. 2017 was a roller-coaster of all kinds of sorts. I published a book, I'd fallen in love and lost that love, I reconnected with people I thought I had lost, hired a publicist, I left a good job to pursue a dream, the list could go on. I had traveled 4,675 miles in 8 days on a road trip of a lifetime. Life is good as it can be hard, but what matters most is how you thrive through all of it, how you persevere through it amongst the crashing waves, and even the calm. What an AMAZING experience this was. 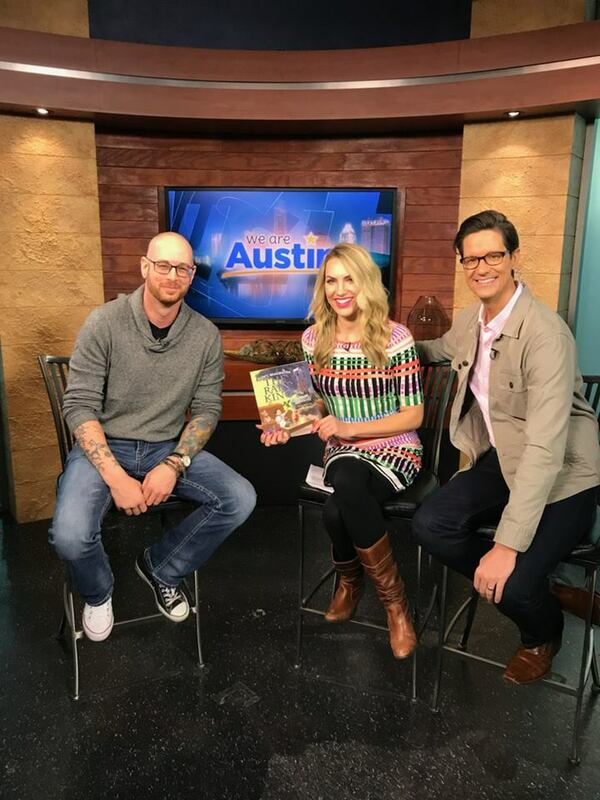 This morning I had the pleasure of discussing Jason's Imagination "The Rain King" with the awesome folks at "We Are Austin" on CBSAUSTIN. I have to admit I was a little nervous, and it although it showed, hosts Taylor and Trevor were fantastic at making me feel welcomed and like an old friend easing the first time jitters. This was a lifelong dream come true, being on TV. I had always though it would have been for music, but to know I still found a way to create something positive and constructive to share has me smiling from ear to ear. We are not guaranteed or promised any form of success, but we ARE guaranteed a fighting chance. As I said in my last entry, life can knock you around sometimes, but if you can stand to take the hits and persevere you might just end up on top. A huge thank you to Taylor, Trevor and the entire crew at We Are Austin for giving me such a heartfelt opportunity to share my story with you and your viewers. Now onto the next show! Added to the list of television appearances this month for Jason's Imagination is CBSAUSTIN "We Are Austin" LIVE between 9-10AM Jan. 11th 2018. You can also live stream the show at cbsaustin.com or you can rebroadcast the show at www.cbsaustin.com/features/we-are-austin around noon. Thank you all for the continued support and encouragement throughout the entire adventure. I am unbelievably fortunate that an idea I drafted up in a work truck one day turned into a published book backed by my family and friends, and my extraordinary publicist Courtney (@Smith Publicity) has begun its accent to a success I could only have dreamed about 4 years ago. I know life can sometimes feel like a Semi-Charmed Life when the roads you travel leave you bumped and bruised, but if you just hold tightly to the steering wheel and keep your GPS coordinates to the destination you'd surprise yourself that all those detours, stop signs, pot-holes, highway miles and wrecks were exactly what you needed to be the person you needed to be at the light at the end of your journey. 2017 has finally passed and made way for a new year, and thankfully so. Life's drum beats strong with a deep resonance and to the core of our souls. We feel the breath of the cold winter wind on our faces still this January, maybe a little unsure of our journey, but with determination and perseverance to overcome last year's struggles. We try too many times to rewind the VHS moments of our lives when the present becomes just to heavy to hold. I know from personal experience how crippling that fear can be to move on, move forward, let go, say goodbye and embrace the sky of an ever-glowing life ahead of you. We build our walls so high we lose sight of all the beauty we have surrounding us afraid of the dark yet living in it everyday. This year tear down that wall leaving it in crumbling pieces on the ground, crushing those fears, insecurities and vulnerabilities into dust as you walk forward, following the beat of life's drum. "I will never forget you my American Love, and I'll always remember you wild as they do come", that's my drum. What will be yours? So it's Dec. 26th. The wrapping paper has been ripped open, presents finally revealed, the smiles have been photographed, hugs and thank yous passed around like cups of eggnog. Picture perfect moments to last us til next year. Even here in San Antonio, Texas you can still smell the wood burning in fireplaces, the lights still hung and waiting to flicker bright just one more night, or two, before they are taken down and packed away. Though Christmas has passed, it is a sign of a new beginning as Jan. 1st 2018 is only a blink away. A clean slate, a restart, rebirth, a much needed 2nd chance or even the beginnings of your 1st adventure. Find some time to take the next 5 days to really reflect on this past year. Are you where you want to be? Are you living your life, or are you just existing in it? What have you done to write your own story? As 2018 comes to steal 2017 like a thief in the night keep your loved ones as close to your hearts as you possibly can, not just once a year, but for always. Ring in the New Year with love, laughter, champagne and make the next year of your life count. Be safe, and I'll see you all in 2018. Well the holiday season is here, and Christmas is just around the corner. The trees have been up for weeks, lights have been hung and presents have been wrapped. Grown ups and children alike are teeming with excitment to see what Old Saint Nick has brought them under the tree; naughty or nice. The Christmas spirit can bring such joy in what at times feels like a fleeting moment. You hear your favorite holiday song or see your favorite movie and you're whisked away to a fond memory, or making new ones to last a lifetime; and for some remembering a cherished loved one(s) lost to the passage of time. However you spend this holiday season, I hope you are able to surround yourself with love, laughter, food, family and friends. For those that are traveling this weekend, please be safe! Happy Holidays from all of us here at Jason's Imagination. May 2018 be a better year for us all. I am so excited to welcome you to my new blog. I am, of course, your host Jason Edwards, but feel free to call me Jase. I wanted to create a place where I can share my own adventures and experiences throughout this journey in hopes to inspire you to create your own. Here you will also find insight into Jason’s Imagination I wasn’t able to put in the books, well… without making them novels. Coming in 2018 I will share articles I have written for various magazines, my personal experiences in making “The Rain King” and what it took to create a finished published book (things that worked and things that didn’t). I will also express the importance of hiring not only a qualified, but reputable publicist and share some of the behinds-the-scenes craziness that goes into touring for your book. And from time to time just share with you all some of the random things that happen in my life. Have as much fun here as I have had writing, creating and sharing my imagination with you. Live loud, but love even louder!